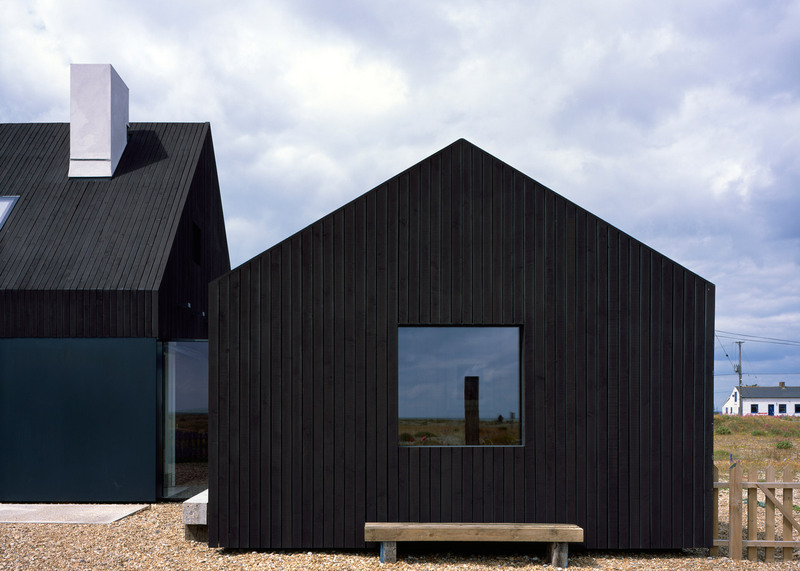 London-based Rodić Davidson Architects has become the latest architecture studio to build a house on the shingle landscape of Dungeness beach in Kent, England (+ slideshow). 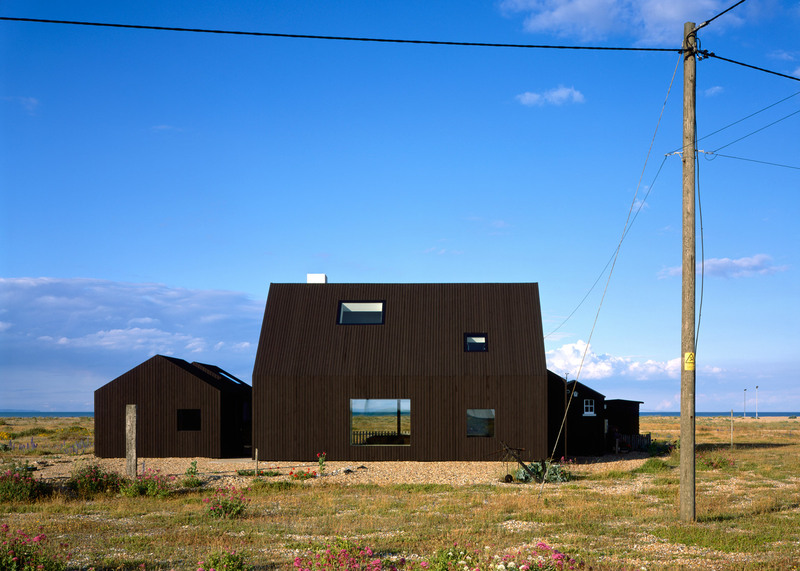 Replacing an old fisherman's cottage, North Vat is a two-storey home for a couple made up of three adjoining cabins, each with gabled profiles and dark-stained larch walls. 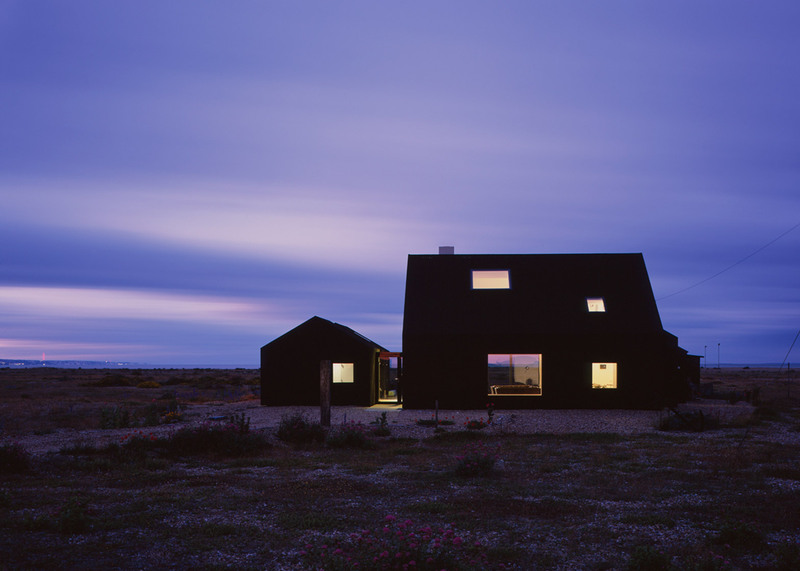 It is one of several architect-designed properties on the vast seaside landscape, including Simon Conder's Black Rubber Beach House, the Shingle House by NORD Architecture and Guy Hollaway's Pobble House. 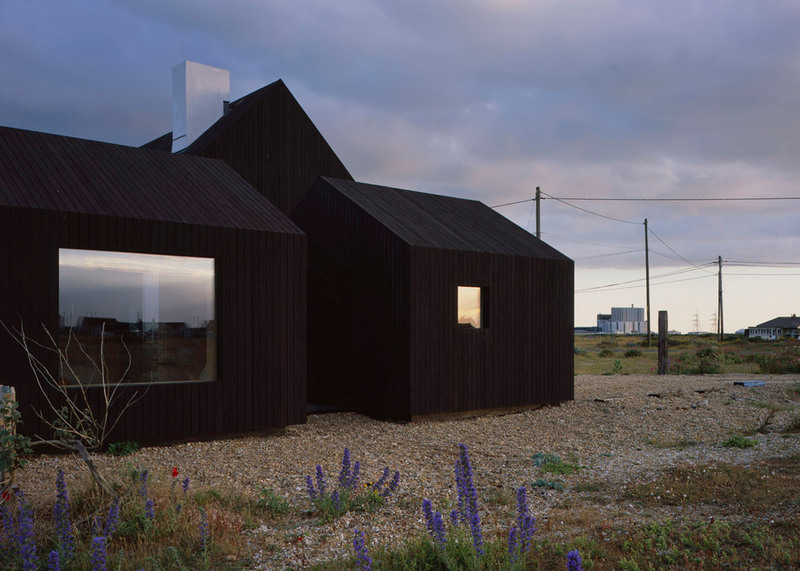 Rodić Davidson Architects wanted the building to reference Dungeness fishing huts and their bitumen-stained walls, but also to "break away from conventional layout and form". 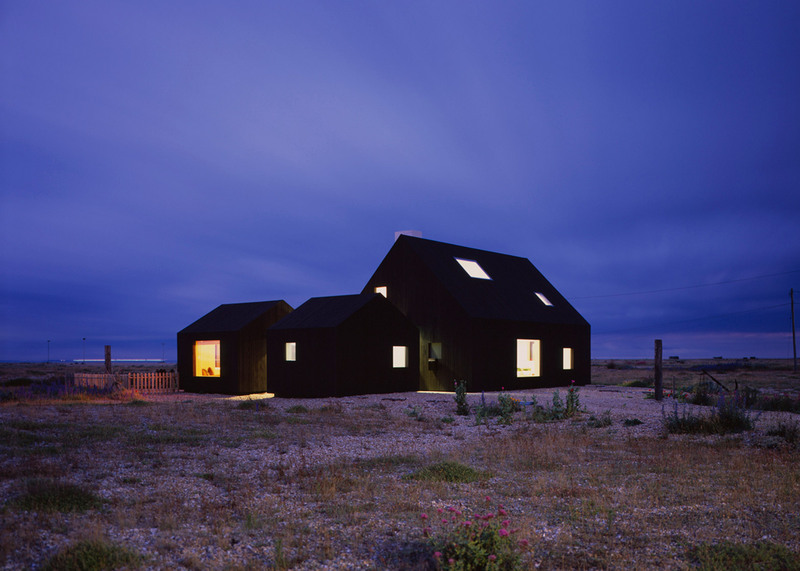 Breaking the building up into three black-stained timber cabins was their way of achieving this. A large two-storey block contains the main living space and master bedroom, while the smaller huts contain a study and a second bedroom. All three are connected by a glazed entrance corridor, L-shaped in plan. "Our brief was to create a single living environment, allowing for entertainment, enjoyment and art," said Ben Davidson. "This was to be a calm and simple space where everyday activities could co-exist and all aspects of the surrounding landscape could be observed." "Our piece celebrates the inherent beauty of simple, 'elemental' forms, and explores how these can create complex spaces and experiences within a cluster," added Siniša Rodić. "All architectural clutter is removed in favour of creating this almost abstract composition," he said. Larch boards extend vertically across both the walls and roof to give the building a homogenous appearance. Rather than bitumen, which was traditionally used to waterproof cabins, a simple stain was applied to create the dark colour. The same wood clads the interior of the study, but is left unfinished to reveal its natural tone. 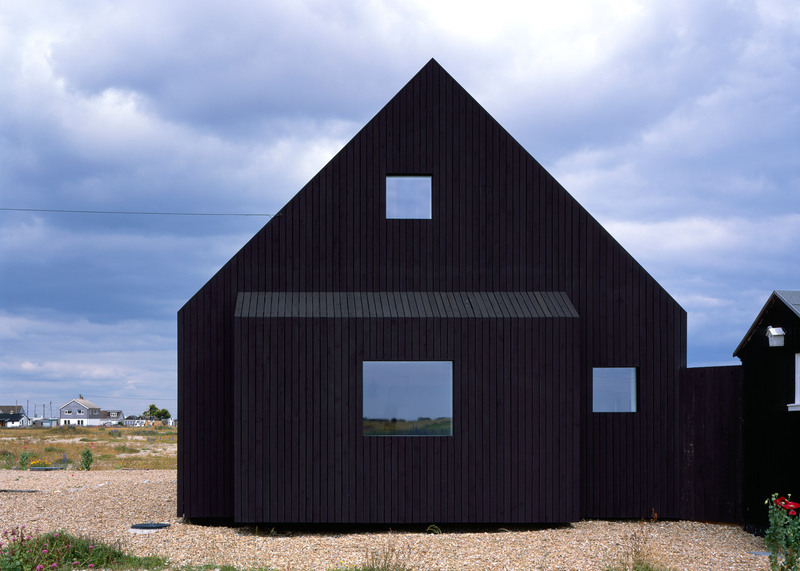 "The replacement cottage and sheds are clad in timber, thus continuing to form part of a larger-scale assembly of black timber structures found in Dungeness," said Rodić. "Each timber is 80 millimetres wide, set out at 88 millimetre centres," added project architect William Adams. "All openings and junctions – windows, rooflights, and doors – have been meticulously set out on this 88-millimetre module." The main block has a more cleanly finished interior, with a concrete tile floor and white walls. The first-floor bedroom is set back from one wall, creating a double-height space. Square skylights bring light into this area from overhead, and these match the frameless square windows that puncture the walls. A bronze sculpture sits in front of one of these windows, facing out to the north. These is also an east-facing terrace that allows residents to sit outside and view the ocean. Dungeness is the only place in Britain officially classified as a desert. 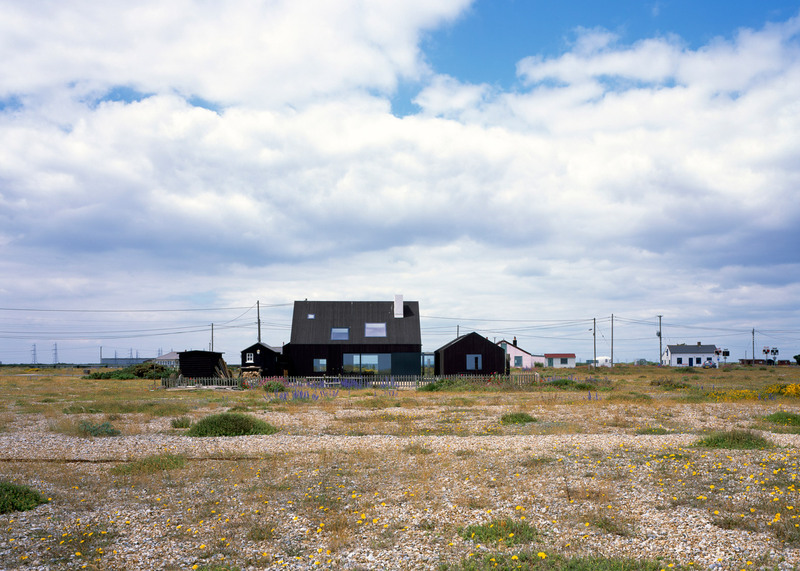 It first attracted attention when the late artist Derek Jarman moved there, but is also an important nature reserve, home to over 600 different types of plant. Photography is by Hélène Binet.